We work with a diverse group of organisations who are using cycling to overcome challenges, break down barriers and bring people together. 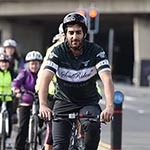 From mental health groups to homeless charities, housing associations to organisations that support refugees, the Cycle Friendly Community programme encourages and supports communities across Scotland to take a leading role in increasing the number of people who cycle locally. The programme provides funding as well as an award accreditation. The development fund supports projects which improve cycling facilities and promote cycling for a community, increasing access to bikes and opportunities to cycle. The funding provides a significant opportunity for your group, charity, or organisation to invest in cycling and support other charitable aims. Studies have shown that regular exercise not only improves physical health but can reduce stress and improve mental wellbeing. Cycling provides independence, grows people's confidence and can support in making someone feel at home in a new place. Using a bike to travel short distances can save money and has a positive impact on reducing our carbon footprint. Community groups across Scotland can apply for between £2,500 and £20,000 for projects encouraging and supporting communities to take a leading role in increasing the number of people who cycle locally. 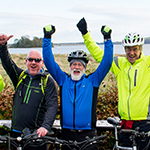 The Cycle Friendly Communities Development Fund is open to community focused groups who are actively working to increase opportunities for people in the local area to cycle. Read the guidance notes and complete the application form. Send the application form to petermills@cycling.scot by 5pm on 31 May. We advise that you get in touch with us prior to application at the email above. 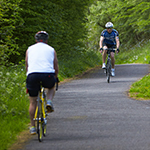 The nationally recognised Cycle Friendly Community Award recognises communities that have contributed to promoting cycling as a healthy, sustainable travel choice, and sets out a pathway for those committed to becoming Cycle Friendly. The award is aimed at encouraging and supporting community groups across Scotland to take a leading role in ensuring that anyone, anywhere can enjoy the benefits of cycling. Cycling Scotland encourages community groups who are developing local cycling opportunities to engage with the award as a support tool and to gain recognition for their achievements. The award offers Bronze, Silver and Gold levels and criteria is based on seven areas: Plan of Action, Barriers, Needs & Opportunities, Funding, Monitoring & Evaluation, Community Engagement, Communication & Promotion, Partnership & Stakeholder Working. For further information on the Award, please refer to the Award Guide and contact us.